So tonight I flavor tripped with the famous BerryFairy. It was hosted at the Belmont bar here in downtown Austin. I won't go over the berry again but you can read about it here. Our wonderful host tonight was none other than the BerryFairy pictured with her friend and business partner Lea. There was a wonderful turnout, I was hoping to see some of my fellow food bloggers but didn't spot any familiar faces. The response was popular enough that it warrented an encore performance this Friday so if you get a chance sign up! Ok on to the spread. We had a wide array of foods to try: goat cheese, brie, salt and vinegar chips, tomatos, it was a strange bedfellows of foods but the selection was designed to show off the strange powers of the miracle berry. I guess this picture of my plate will tell you how strange a sampling we had. It's difficult to explain exactly the tasting experience. We start with a berry and the instructions to chew on the fruit for two mins and wait for max potency at 10 mins. My buddies Cliff and Les dutifully chewed on the fruit, I have a feeling part of it was to have everyone look like idiot gerbels swishing chewing on this little city. None the less the 2 mins paid off almost immediately. The lemons and limes taste like lemonade and limeade. The pickled jalepeno, were sweet but still spicy. I didn't get the cheese as they still tasted the same for me. The stars of the plate were the plum tomatoes, strawberries and the tomatillos. The tomatillos tasted like giant white grapes! I could not believe it. The tomatoes were like giant sugar bombs and the strawberries tasted like the most impossibly ripe and sweet strawberries I've ever tasted. I tried a few from various tasting stations and they were all the same. Salt and vinegar chips smelled of vinegar but was like popping sugar chips in my mouth. A table companion ordered a well tequila and it was possibly the smoothest tequila I've tasted, dangerously smooth. I'm happy I got to experience the miracle berry first hand. I bought some of the "tables" so I can host a party. Thank you BerryFairy for the good times! Peach Bento - 50th Bento! So I counted it up, this is my 50th bento for my eaters. 50! Wow! granted I've posted more, but there's a lot of Offtopic "yammering" and also some meals that weren't lunches. So my eaters should have collected 50 small index cards with my lunch time greetings and menu description! Go me! Ok enough back patting. Another Fruit themed bento this week. My wife suggested a peach challenge for me. Didn't have time to hit the farmer's market this week so I had to make due with the regular grocery store. Despite the tenderloin, I came in under the five dollar mark this time (I was impressed) I suppose partly due to the fact that peaches are in season. I scoured the internet for various ideas and came up with this set of highly modified mix and match recipes. First of we start with a Pork Tenderloin with Peach Chutney. The shot isn't very pretty, infact the color from the chutney messed with the color of the overall picture (I picked the best one). I think it's my excuse to buy more lights. I digress. The tenderloin is a standard oven baked pork tenderloin, I purposefully cooked it on less done end anticipating the microwave to finish the job for me. The chutney is a simple mix of cooking down onion,ginger, peach spiced with cloves, cardamom, and a dash of nutmeg and finished with some vinegar and sugar. A great sweet and savory balance to go with with ever adaptable pork tenderloin. Next we have basmati fried rice with peaches. The base recipe had some good intentions with it, but I felt that it was missing a few things, maybe it was because I was using brown basmati rather than white. I cooked the peaches down instead of leaving them raw, I felt it would bring out more of the sugar component. I also added ground ginger and ground cloves because the only flavor that was coming out was the nutty brown rice. Everyone enjoyed the rice, and I got comments of it could have stood with a bit more on the spice to bring it all out. It was pretty hard to resist the call of a chilled berry soup from the strawberry bento, this time since I was doing less I put it on the menu. This is a nice Chilled peach soup, yes I was bad and used some cream in this, but having some local honey left over from an earlier bento, I did use that instead of the refined white sugar. Give a little take a little. With these chilled cream soups lots of times they kind of taste like melted ice cream (which in a way they are), I made sure to cut back on the cream and add a bit more water and juice to make it more soup and less ice cream. Last but not least, you can't do a peach bento without doing a cobbler! I'm not much of a cobbler expert (yes I should have plated for the picture). But I'm told it was really spot on good. Being a cobbler novice, I took some of the best of breed on cobblers (there are many opinionated cobbler recipes, fruit then batter, batter then fruit etc..) the common theme was a lot of badness including stick(s) of butter. Being of the heath conscious side, I opted for 1/4 of the butter and adding some sugar and cinnamon on top hoping the carmelized sugar and spice would make up for the amount of calories I saved by cutting so much butter. Apparently it worked, I still admit it's not the healthiest dessert I could have gone with and yes I could have used my gluten free flour to make this box gluten free, but I didn't want to mess with it too much. A fun bento to put together, the grocery checker admired my appetite for peaches. Still trying to think up what to cook for next week, I've not had much time to think about a batch of new themes. I'm going to that Miracle Berry event I was talking about. I shall have camera in tow and put up a post! Sorry about the sparce posts, been dealing with some emergencies here at home. I managed to dig out some time and come up with a Korean inspired bento. This one's been on my list to do for quite some time. I'm not sure why I never got around to building a menu, better late than never I suppose. This box is gluten free box, even though we've reverted back to a normal diet. Ok on with the show. I really enjoy korean food, I think because of all the little side dishes and pickles they serve you, so no korean themed bento could be complete without a bevy of side dishes. Starting from the left we have Sook Ju Namool, its a lightly seasoned bean sprout dish served cold. The bean sprouts were quickly blanched and a bit of salt, garlic and sesame oil are added. Next we have Oi Muchim, or spicy cucumber salad. The process for this and the next dish is a light quick pickling. I managed to get my hands on some korean cucumbers (thank you farmers market) very different from regular cucumbers. Last we have Mu Chae, spicy daikon salad. Korean food seems to be big on the red pepper powder, when buying it at the grocery store I could only get it in giant bags. Surprisingly despite the angry looking red flakes both dishes were very mild and got high praise from my diners. Last I broke out the trusty indoor grill and made some Bulgogi (on the right) and Galbi Gui. Bulgogi is a barbequed marinated beef that has been very thinly sliced. Galbi gui on the other hand is a barbequed marinated beef short rib. Both dishes make use of the same marinade it's just different cuts of meat. The marinade is very fragrant (thanks to the sesame oil) and the sugar in the marnade gives that perfect caramalized char. I've already gotten questions about how I managed to slice such thin beef. If you look around most asian grocery stores will stock very thinly sliced beef in the frozen section for things like hot pot, or shabu shabu. Or if you're my Dad, you freeze the beef and slice it with a giant cleaver. I had a great time making this bento, it's a welcome change from the stress of family emergencies. I hope to post up some more later. Hi all. 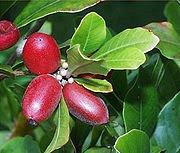 A lot of my friends have been talking about the "miracle berry" or "food tripping". There's a local Austin event happening and I wanted to get the word out since so many of you have asked about organizing a party (yes at some point I'll still have one at my place). Well this one is for a good cause! WHAT: The Berry Fairy is bringing Miracle Berry Flavor Tripping to Austin, TX. frosting, and stout beers like chocolate milk! WHEN: Wednesday, July 29, 2009 from 6:00-8:00pm. www.theberryfairy.com. The event is expected to sell out. I managed to make the paper. Very cool! Thanks to Addie Broyles for the nice write up! And to any new visitors thanks for coming by. I'm back with another post, sorry about the sporadic posts things are very busy. I'm still getting over the cold I caught a few weeks back, this cough will not go away. I suppose one good thing came out of this cold, sitting in the doctor's office, I came across an issue of Better Homes and Gardens. The issue featured a showcase on strawberries, all strawberries all the time. What a great idea! Better yet, my new found love of going to the local farmer's market had to play into the bento. So the mission was produce the strawberry bento supplemented with ingredients from the farmers market. The farmers market was chock full of wonderful produce and meats. The prices were perhaps a little bit more than I would spend on groceries, but if you factor in the cost of organic produce I think the money comes out the same. The real difference is that all of that money goes straight to the hardworking local farmers. It was great speaking with the farmers, they were all very eager to explain their produce. In the photo you see three types of heirloom tomatoes, cucumber, a large bunch of basil, local honey, and hand made strawberry jam. It was nice tasting the tomatoes side by side there is a distinct difference in acidity and texture, I recommend going to your local farmers market and trying some. I hope to continue to go and shop at the market and check out the meats and fish (straight from the gulf) and create some nice bentos. We'll start with a spinach salad garnished with tomatoes and strawberries accompanied by a strawberry vinaigrette. This one was a bit of an improv as I couldn't resist doing something with those beautiful tomatoes. The dressing was actually perfect for the salad, a bit more sweet than a regular vinaigrette to really complement the tomatoes and spinach. This particular recipe took me a bit off guard. I would not have really considered strawberries for any sort of savory recipe. In some way it makes a lot of sense to replace tomatoes with strawberries on a bruschetta. I tossed in some arugula for that hit of spice and made use of that beautiful basil from the market. The goat cheese and strawberries broiled nicely in the oven. This was a very colorful and tasty dish. I served the pulled pork as a wrap, so as a condiment I put together this strawberry salsa together. Again I supplemented the recipe with some of those wonderful tomatos. I'm quite impressed with the use strawberries in all of these recipes, it is inspiring me to look into more creative uses of other fruits. Finally the star of the show is a really tasty pulled pork with a strawberry barbecue sauce. The pork was cooked with fresh strawberries and braised for two and a half hours. While the pork was resting you skim and reduce the liquid and add more strawberries. The strawberries provided the sweet component to the sauce as opposed to the sugar you would normally use in a bbq sauce. I think this is my favorite pulled pork recipe. I bought a nice new dutch oven for the occasion which produced a superior pulled pork. This recipe is a definitely a keeper. I've learned a lot about looking at ingredients and trying to cast them in a new light than what I'm use to. This was a fun bento, and a welcome distraction from my busy schedule these days. Hopefully I can get back to a regular schedule again soon. As always thanks for stopping by, and if there's a recipe you want I'm happy to post it in the comments just ask!